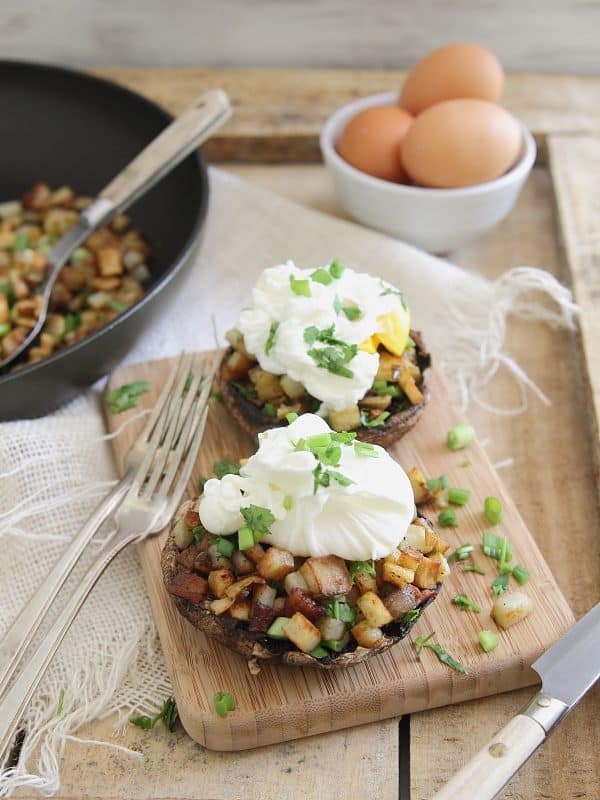 These jalapeno cilantro hash stuffed portobellos are deliciously salty from the bacon with a kick of spice and topped off with a poached runny egg. I’m having a love affair lately with pickled jalapenos. If you haven’t noticed, they’ve been in like 3 of the past 5 recipes. It’s the vinegary pickled-ness + spice…just omg, so amazing. Plus, when you touch your eyes after handling pickled jalpenos, they don’t turn to fireballs in your head like when you do with fresh ones. And, um, I somehow do that every.single.time I cut a jalapeno. So let’s talk about hash + gluten free living. As one of my last posts with Udi’s, I wanted to touch on the basics of gluten free living again like we did over some amaretto fudge cookies in the winter. I was walking the aisles of Trader Joe’s last night and was literally floored at the amount of gluten free options in the frozen breakfast foods section. I mean, there was practically everything you could eat for breakfast in a gluten free version from waffles to pancakes to hash browns to burritos. And while I think it’s awesome there are that many options today for people that need to eat gluten free, I also kind of hate that it just promotes the “easy way out” of grabbing pre-made food. Bringing me to the most basic of things when we talking about gluten free living: EAT REAL FOOD. If I had a tagline for this site, that would be it or, one of them. I don’t have one because I can’t actually decide on the many forcefully tough love kind of statements about good/real food I like. And I get it, sometimes you just want that exact same thing in gluten free form whether it be a waffle or bread or bagel or cracker (and yay for living in a time where there are plenty of options) but, I think so many people think of what they can’t have or how to replace whatever that is with something else rather than thinking of what they can have, real food. There are still entire food groups intact that are gluten free. Vegetables, meats (bacon! ), dairy, nuts…so chill with the gluten free label a bit and rethink the possibilities. Being gluten free doesn’t have to always mean eating something stamped with the label “gf” on the outside of the packaging. 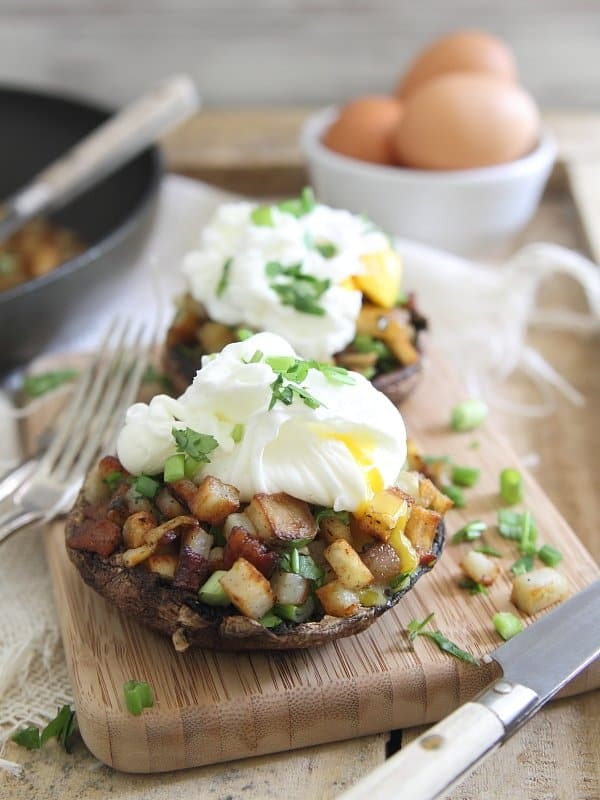 Does a pancake breakfast really sound as good as these spicy jalapeno cilantro hash stuffed portobellos? Because they happen to be gluten free too and they didn’t come from a gluten free labeled box. Heat a large skillet over medium-high heat. Add bacon once hot and cook until crispy. Remove bacon with a slotted spoon and set aside. Add the potatoes to the same pan with the bacon grease and arrange in an even layer. Season liberally with salt and pepper and let cook for about 15 minutes only tossing once browned and crispy on each side. Meanwhile, place the portobello caps gill side up on a baking sheet and drizzle with the olive oil. Broil on high for 10 minutes until they release their water. Remove from the oven, drain the water out of the center of the caps and set aside. Add the jalapenos to the potatoes during the last minute and toss to combine. 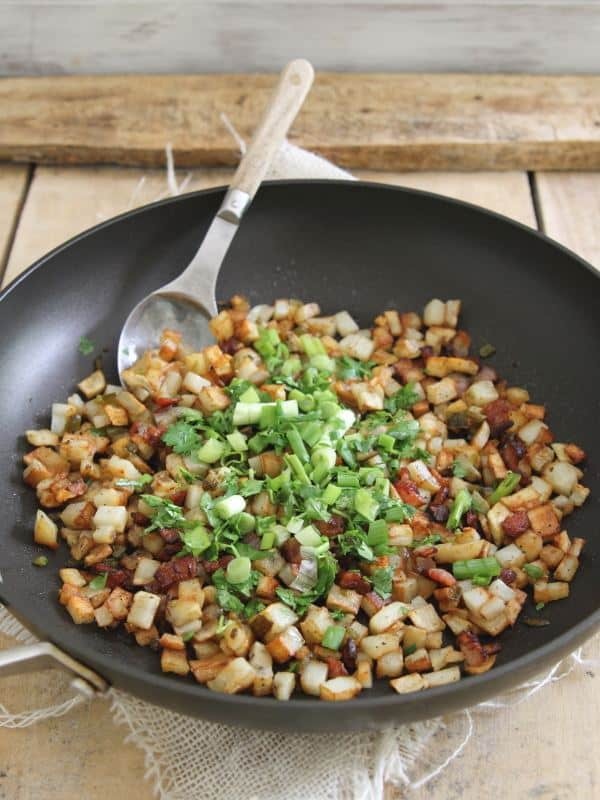 Turn the heat off, add the green onions, cilantro and the crispy bacon to the skillet and toss to combine. 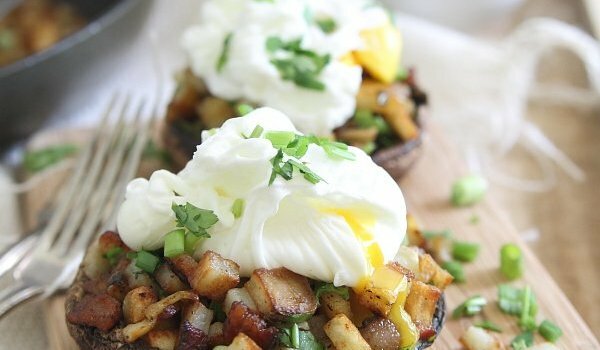 Spoon the hash mixture into each portobello cap and top with a poached (or fried) egg. Wow–what a breakfast! The hash alone sounds delicious, so many flavors to love. It looks gorgeous. Your presentation skills are top notch! Bring on the spice, baby! These stuffed ‘shrooms look amazing. My husband will sit in front of the television and consume an entire jar of pickled jalapeños. He’s a weirdo. Pinning. This sounds so much more appealing than packaged pancakes. Hash of any kind is a winner in my book. I am sorry to say I’ve never had a pickled jalapeno. Very curious to investigate this new food. Minced Jalapenos, so you don’t see them but still taste them. Living dangerously there if you don’t like spicy food! The filling sounds so yummy! I love everything about this! Matt wouldnt touch them with a 10 foot pole because he hates cilantro, but hey, more for me right?! Thanks, Jen. Looking forward to meeting you too! Really excited for BHP, I had a ticket last year that I had to sell at the last minute b/c of a conflict so I’m glad I can make it work this year! made this for a brunch party today. What a hit!!!! Delicious. It was a little time-consuming as I made 12 poached eggs and a triple batch of hash and mushrooms, but I followed the recipe and it worked very well! That’s high praise from me because I’m always tinkering. Well done! PS, Was perfect for the GF/DF folks, too!